THE HAGUE, February 16. /TASS/. Many things remain unclear today in the processing of primary radar data, which the Netherlands received from Russia as part of a criminal investigation over the July 2014 crash of Malaysia Airlines flight MH17 in the war zones in eastern Ukraine, the Office of the Dutch Attorney General said in a report on Thursday. "It will still take considerable time to analyse the radar images," it said. These images were made available to the Dutch side one month later but according to the Dutch attorneys, the problem stems from an unusual format, in which Russia provided the information. "For the exchange of information air traffic control agencies often make use of the so called ASTERIX format, which has been developed by Eurocontrol (the European Organization for the Safety of Civil Aviation - TASS)," the Attorney’s Office said. "The International Civil Aviation Organization (ICAO) does not oblige the use of this format, but in a manual it does mention the ASTERIX format as a useful standard," it said. "The ASTERIX format is internationally accepted and is being used worldwide." "The Russian Federation has not provided the radar data using the ASTERIX format," the Attorney’s Office said, adding that ASTERIX was used in the Russian Federation. "In order to still be able to analyse the images, the Russian authorities had included separate software without a manual." The software was written in Russian and that is why the Dutch experts had to translate it first and then to test it in order to verify its functionality and realiability, the report claimed. "Translating and getting familiar with the software were both time consuming," it said. "Only after that, the data could be analysed." According to the Attorney’s Office, the transferred data show less that if it had been provided in the ASTERIX format. 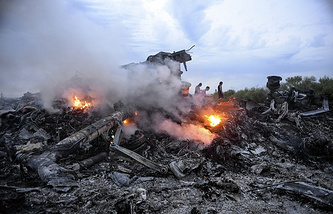 To move on with the necessary procedures, the team investigating the MH17 accident had to hire ‘external expertise’. Also, the investigators informed the Russian judicial authorities that they would sent an additional request for legal assistance, the report said. The first query for legal assistance that the Dutch side sent to Russia in October 2014 contained a request for providing the full amount of information that might facilitate investigation. The Russian corporation Almaz-Antey, the manufacturer of the Buk antiaircraft systems, one of which allegedly brought down the misfortunate flight MH17, said in September 2016 it had received primary unprocessed radar images of the airspace in the area of the jet’s crash on July 17, 2014. The data had come from an enterprise reporting to the corporation, it said. Almaz-Antey handed the information to specialized Russian agencies for scrutiny and sent it to the Netherlands on October 26, 2016. Analysis done in Russia shows the data from primary radar imaging rules out a version of the tragedy that claims an air defense missile that supposedly brought down the Malaysia Airlines jet was launched from a place to the east of the spot of the disaster or from the Snezhnoye populated locality. A joint investigative commission consisting of experts from Australia, Belgium, Malaysia, the Netherlands, and Ukraine claims that the missile was launched by a Buk system located near the township of Pervomaiskoye to the south of Snezhnoye at the time of the accident. On July 17, 2014, Snezhnoye was controlled by the east-Ukrainian self-defense forces. The Boeing 777 that performed the flight MH17 had 283 passengers and fifteen crewmembers aboard. None of them survived. Prior to the tragedy, several military aircraft had collapsed in the zone of the armed civil conflict in eastern Ukraine after being brought down by weaponry systems of various types.